You are currently browsing articles tagged 600D. Get a Canon 600D / Rebel T3i (or older Canon 550D / Rebel T2i) if you are new to photography or to digital SLR photography, or want to upgrade from an older Rebel because you want higher image quality and more mega-pixels (or HD video). If you have been happy with the features and controls of your previous dSLR camera and have not discovered the need, in your extensive use of it, for any specific additional features, there is no need to look beyond the T3i / 600D. 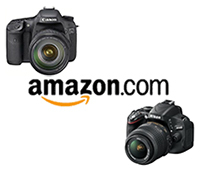 See the T3i on Amazon. Get a Canon 60D if you have outgrown the capabilities of an older Rebel like an XTi or T1i due to your greater experience and more demanding shooting needs which require more direct or sophisticated controls, faster shooting speed, more precise autofocus system, and more complex customization options. Or you have been pretty pleased with your 20D or 40D and its features but wish to upgrade for the increased image quality and megapixels (or HD video). And/ or you need a more rugged camera for your frequent and demanding shooting and off-the-beaten-path traveling needs. Or if you need the increased 5.3 frames per second continuous rate to shoot sports or action. Or you really like swiveling LCD screens (the T3i has this too). If you typically shoot on Auto or Program mode, you probably do not need a 60D. If you do not manually select your own focus point and have never used exposure compensation you probably do not need a 60D. If you have never used the AE-Lock [*] button to lock exposure you most likely do not need a 60D. If you don’t understand the relationship between aperture, shutter speed and ISO you may not really need a 60D. Or unless you plan to dedicate yourself to learning this camera and the principles of SLR photography and grow into this more advanced camera, consider saving the money or using it towards a better lens. See the 60D on Amazon. Get a Canon 7D if you have extensive experience with a Rebel like an XTi or T1i (also called the xxxD series like the 350D or 500D) or with an older xxD series (20D, 40D) camera, and you know and understand most of the 7D’s controls and advanced custom features, and you specifically need some of them for your demanding shooting needs. If you haven’t passed the above “criteria” for a 60D, you most likely really don’t need a 7D. If you have never used Av aperture priority mode or M manual mode, you should probably gain more dSLR experience before investing in a 7D. If you have never used autofocus tracking settings to track a moving subject across your frame and worried how an interfering object would affect your focus you don’t need the sophisticated AF system of the 7D. If you have never used spot metering to determine a critical exposure level or experimented with back-button focusing you probably will do just fine with a camera less advanced and less expensive than the 7D. Or unless you plan to dedicate yourself to learning this camera and the principles of SLR photography and grow into this very advanced camera, consider saving the money or using it towards a better lens. However, if you often need to take 126 consecutive photos at the rate of 8 frames per second, you do need the 7D. Immediately. Even if you just sometimes need that. Totally worth it. That’s 15.75 seconds of continuous shooting. Who doesn’t need that? You’d make Eadweard Muybridge proud. See the 7D on Amazon. If the 5D Mk II fits your expanding and demanding needs as a photographer, you would already pretty much know that you needed a 5D after your extensive time using a Rebel or a 20D, 40D, etc. Otherwise, getting a 5D means most likely you’d be investing in far more camera than you will actually need or use. If you truly need a 5D MkII, you are most likely already in that phase where you are fully aware that you need it and you are merely saving up and/ or agonizing over when to go ahead and spend (or inform the spouse that you need to spend) that $2500. If you don’t already know that you need a 5D Mk II and specifically why you need it, you probably don’t need a 5D. Plus, as is often the case, many of those who could really take full advantage of a 5D Mk II are those who can’t afford one. (I’m thinking about the talented photographers I come across on Flickr, etc. who are making amazing images with entry-level Rebels.) Feel free to spend $2,500 on a 5D Mk II if you want, but unless you have extensive experience with photography and with a digital SLR, using a 5D is completely unnecessary and is unlikely to help you take “better” pictures than you will be able to with a T3i/600D. If you don’t already know how to use an advanced dSLR camera and why a photographer needs one, buying a 5D Mk II is sort of like buying a washing machine with the buttons, dials, and writing all in Swahili. You know what a washing machine can do and is supposed to do, and you can sort of figure out the Swahili one. But until you properly learn how to use it, if you start turning the dials and pressing some buttons you could really screw things up. And even though the Swahili buttons all look really cool and impress your friends and the other clothes-washers who see it, and the salesman told you it is a “better” washing machine and has a bigger drum, it probably won’t help you clean your clothes better, especially if you don’t know how to use it. Until you learn how, when, and why to use the controls, features, menus, and custom functions of a 5D Mk II or even a 7D, you may be taking worse pictures! At best you won’t be taking advantage of most of the features and capabilities you paid a lot more for. And besides, the 5D Mk II is becoming old technology. You should wait for the 5D Mark III :) Plus, the large, high resolution sensor of the 5D Mk II pretty much requires that you use Canon’s best L-series lenses, so be sure to take that into account. See the Canon 5D Mk II on Amazon. Whichever Canon you choose, learn to take control of your camera and the images you create with one of my Full Stop e-book guides! All of the accessories still apply to the T3i and the T2i (EOS 600D, 550D). Canon just announced the replacement for the T2i called, as expected, the Canon Rebel T3i / EOS 600D. It has a few upgrades from the T2i, borrowed from the 60D, including the high resolution swivel rear LCD screen, remote flash capabilities, some additional menu options, and built in Creative Filters. Canon also introduced a new 18-55mm image stabilized kit lens to pair with it. Read more about it here at DPReview, and I will fill in more details about it soon. As Canon’s own press release dramatically states, Canon Empowers The Masses To Take Better Photographs And Video With The New EOS Rebel T3i And EOS Rebel T3 Digital SLR Cameras. Wow! I’ve completed a Canon Rebel T3i e-book user’s guide, following in the footsteps of my popular e-books Your World 60D and T2i Experience, titled Canon T3i Experience. See here for more info. Canon T2i vs T3i (Canon 550D vs 600D): If you are trying to decide between these two cameras, or deciding between the T3i vs 60D vs 7D, please see the post I wrote that reviews and compares the current cameras in the Canon dSLR consumer line-up: Canon T3i vs T2i vs 60D vs 7D, etc.